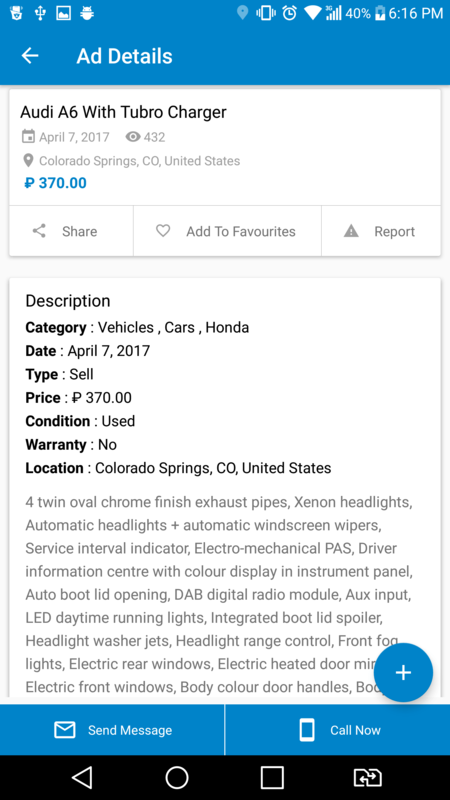 Use our classified ads app for both Android & IOS to expand the user base and drive more listings for your classified business. 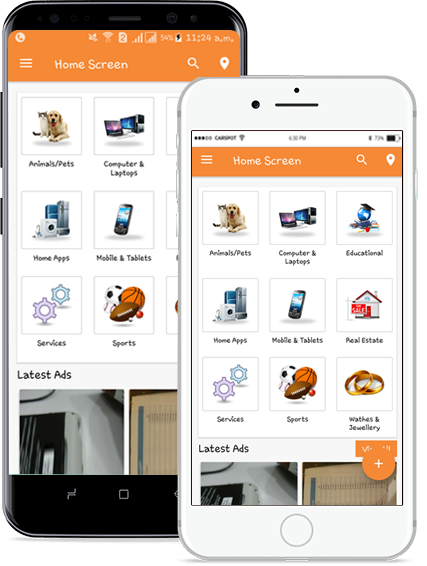 With adforest classified ads mobile apps, showcase your products in the most saleable manner possible. 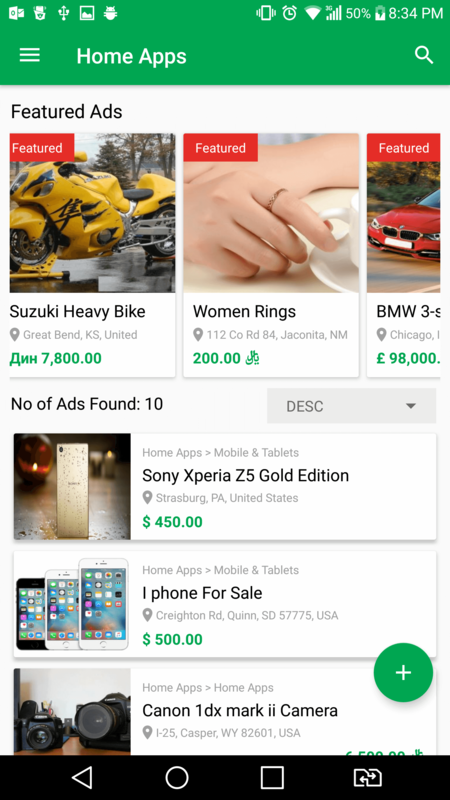 Best classifieds apps with smooth navigation of product listing. 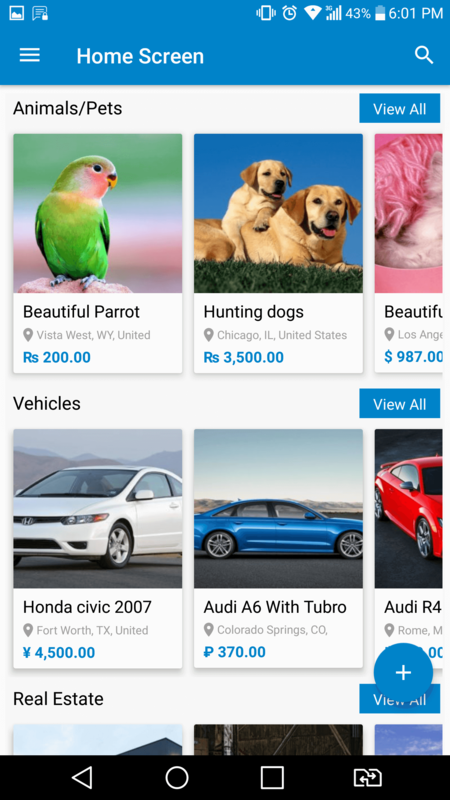 Largest wordpress classified theme is now available with classifieds mobile apps, with the quickest and easiest way to set up. It brings your classified website to the next level. Adforest classified apps has a smooth navigation for products listing, easy to use interface and support several amazing features. 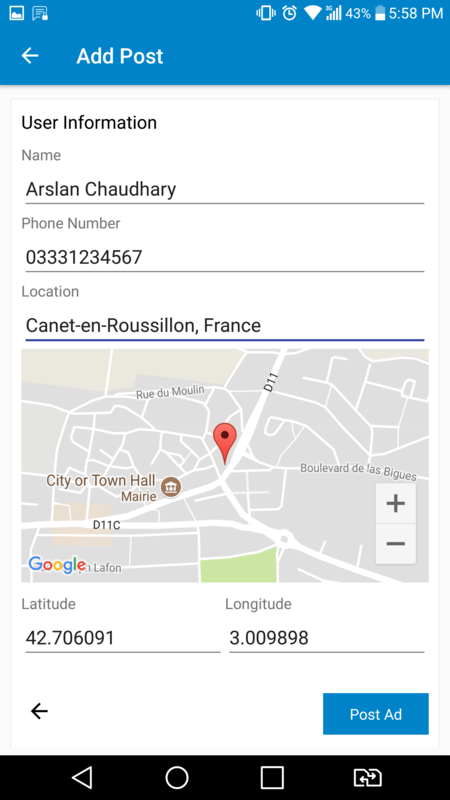 Advanced features supported by this APP including ad posting status, Google Map location, advanced search along with radius search and additionally user can contact seller/buyer with built in messaging system. Get one of the easiest, most secure, and the modern classified ad apps and make your Ads listing website expedient. 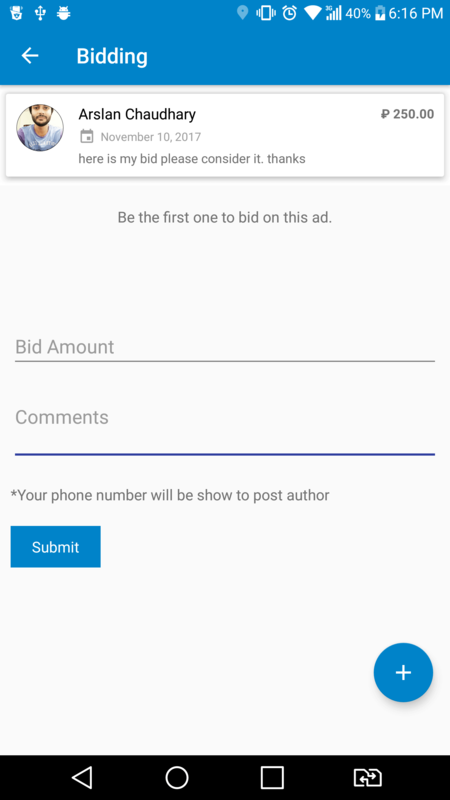 Now you can buy apps from envato and let your users post ads from mobile phone as well. It helps to build a richer and deeper relationship with your customers. 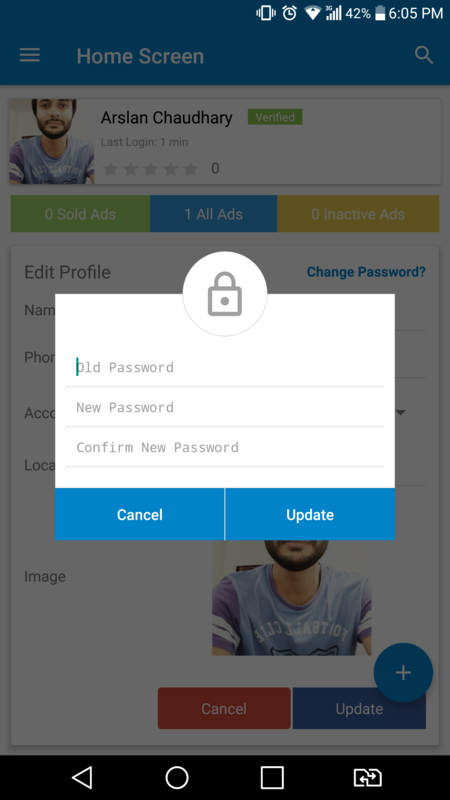 Most of the classified users get confused while listing their ads on mobile app. 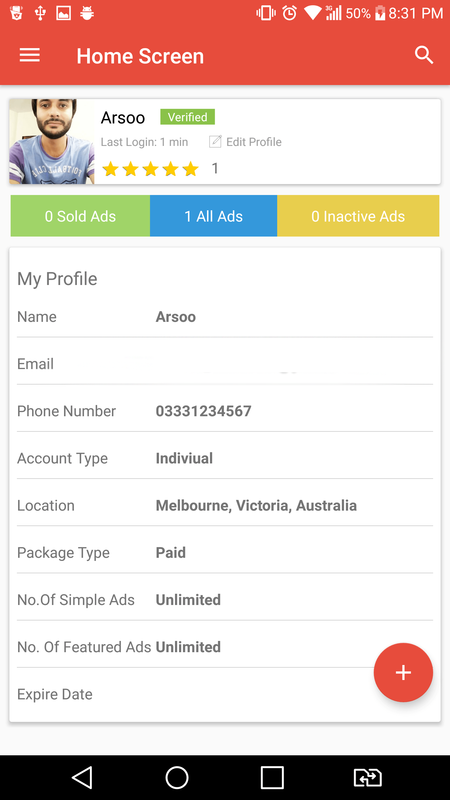 We have made it simple and easy for them to list thier ads and sell out instantly. Buy our classified apps from envato. You can use it with our WordPress theme or as stand alone. Installation of a plugin is very easy and simple. Just install our WordPress app plugin and all the options will be in your hands. You can change settings from App theme options. You can change text, logo and images from theme options settings. 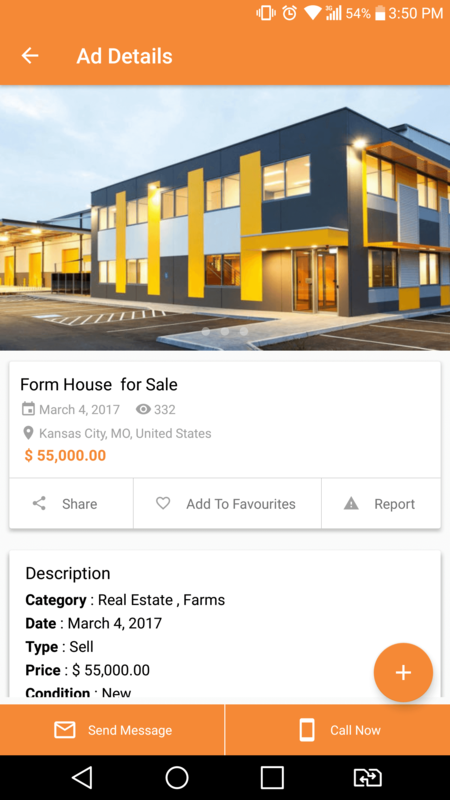 your app is ready and you can upload it on app store with your brand name and drive more listings for your classified business. Our Classified apps contain most promising features that no ads listing app have. 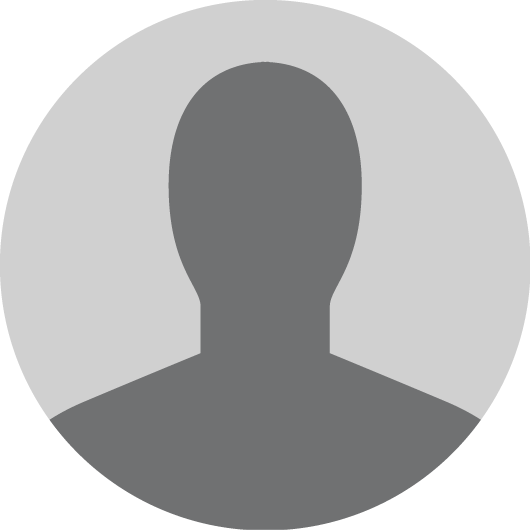 We have created it by following user most wanted features. Our apps have built in messaging sytem like our WordPress theme. Buyer can contact seller via messages or mobile number. Most intellegent and advanced search will help user to search by location along with radius, type, category with multiple ways to get their desired ads. We have introduced new feature in classified applications that is bidding. User can offer his price to seller and all the bids will be public. Well managed feature for classified category is category based custom fields. You can ad as many custom fields based on categories as you want. Most convenient way for users to register or login using their facebook and gmail accounts. User just need to click on login with gmail or facebook and they are logged in and even sign up..
classified apps are fully translation ready and you can use it in any language that's supported by WordPress and WordPress has translations for over 162 languages. an additional features like report an ad and share an ad on social media is available and you can share your post almost on all famous social media sites. 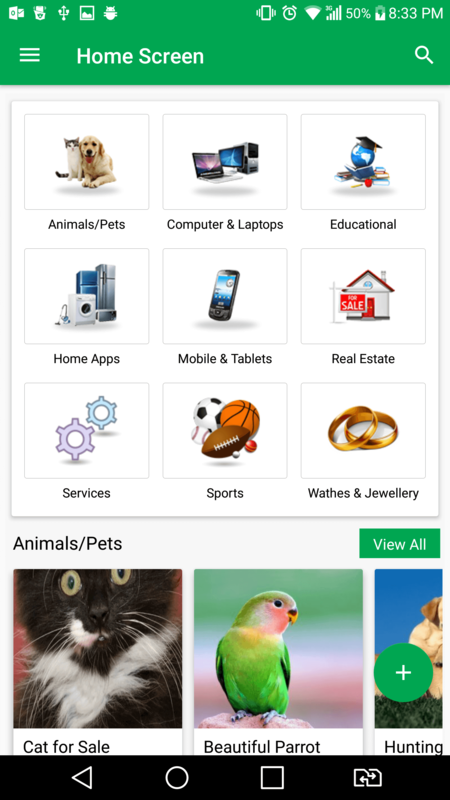 We are happily annouce that Our mobile classifieds applications are fully RTL supported. You just need to translate your strings using POedit. We have multiple built in colors option for you. You can choose your color from app theme options from back-end. you just need to select color and save. 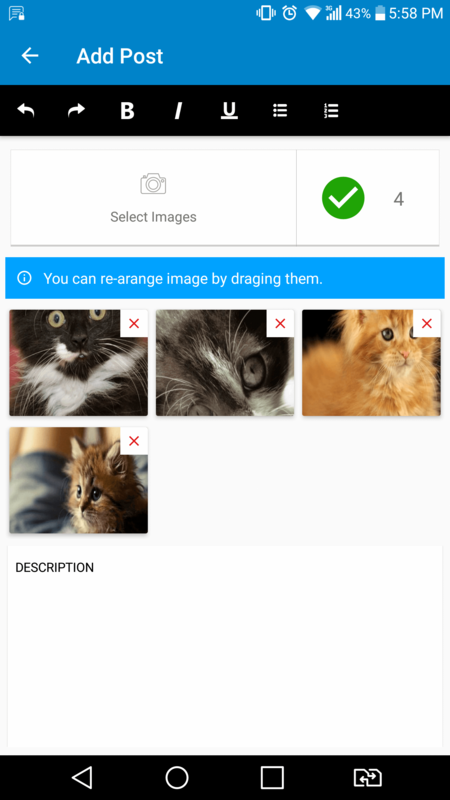 We tried to make applications attractive, user focused and dynamic. Here are some of key screens. I rate AdForest theme as 5 stars because it is wonderful theme which has many many features, with high flexibility, very fast customer support, very helpful documentation and very very easy to use with huge options that make you able to choose between them as you like and suitable for you. I advice you to buy theme .. it is best shop and ads theme . Super reliable and super flexible. After looking for ages for a platform to be flexible, reliable and also functional without bugs I finally found this one and will stick with it in the future as it gives me all the features I might ever need from a platform like this. The support team is super friendly and very professional. Highly recommended !. These guys are superb. This is a theme i've been looking for since last year. Most likely designed for me. The graphic design, arrangement and structure of the theme are classic. Customer support is really great. When it comes to classified ads, nothing beats this theme. Nothing! You can search the web yourself. I've already dropped some plans and now on my journey of great success with this theme. These guys are amazing! They are always available to answer my questions. As I'm about to ask if a feature exists, there is a new update with the same feature I'm looking for. It's like they are mind readers. I'm very happy with this theme. It's worth every penny. Great theme and a group of people who work on updating it with all needed and newest features. Very high and professional support with a quick response time. I would definitely recommend products from ScriptBundle. Looking For RTL Version ! 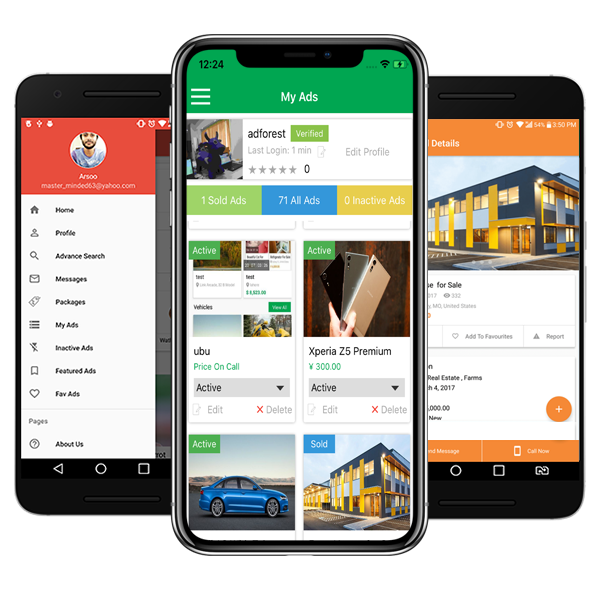 Adforest is a Premium application that contains all the features you need to build a fully functioning classified portal. Our Classified ads apps are come with versatile & powerful features with RTL Support as well. 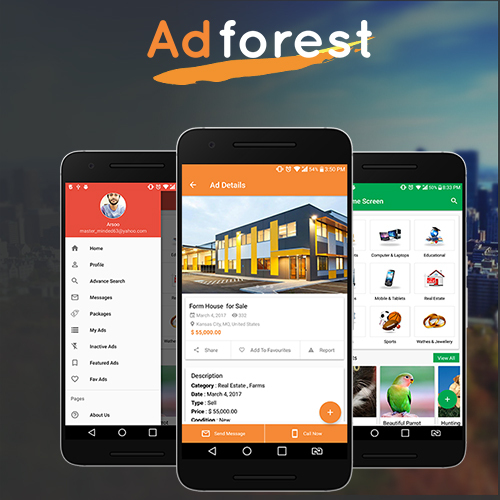 If you want a feature rich application that incorporate everything Adforest is the best choice for you. Do you have any confusion about AdForest applications? do not worry just read our FAQs. Most of the frequently asked questions are answered over here. 1. Are these applications included in AdForest WordPress Theme Purchase? No, AdForest applications are separate products and you have to purchase them from CodeCanyon. 2. Can I use AdForest Applications separately? Yes, you can use applications separately but it will have WordPress backend. You do not need to depend upon any other product or plugin. 3. Can I upload android application on PlayStore? 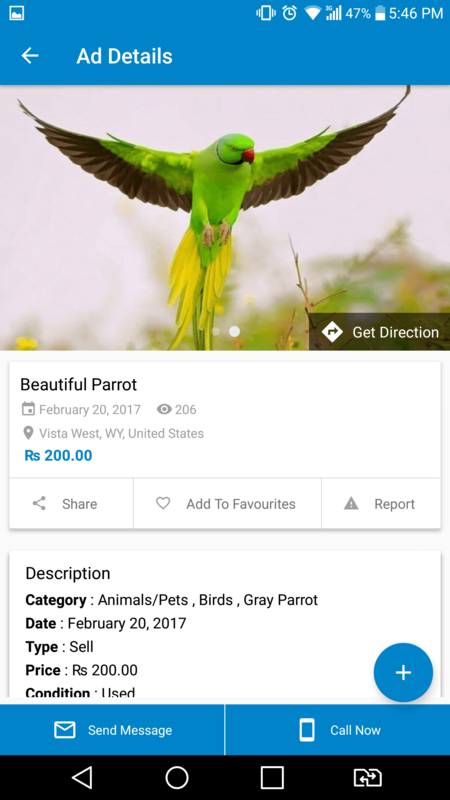 Yes, by purchasing adforest app you can upload it on playstore with your brand name. All the settings are available. 4. Can I upload IOS application on Apple store? Yes, you can upload it on Apple store with your brand name. All the settings are available. 5. Does this include both Android & IOS apps? No, we've both android and IOS apps but need to buy separately because both are separate products. 6. How to set up Applications? Setting up AdForest applications are very easy. If you are familiar with WordPress theme options than its a matter of minutes for you. If you are novice user than we have complete documentation for you. You can set it up easily. 7. 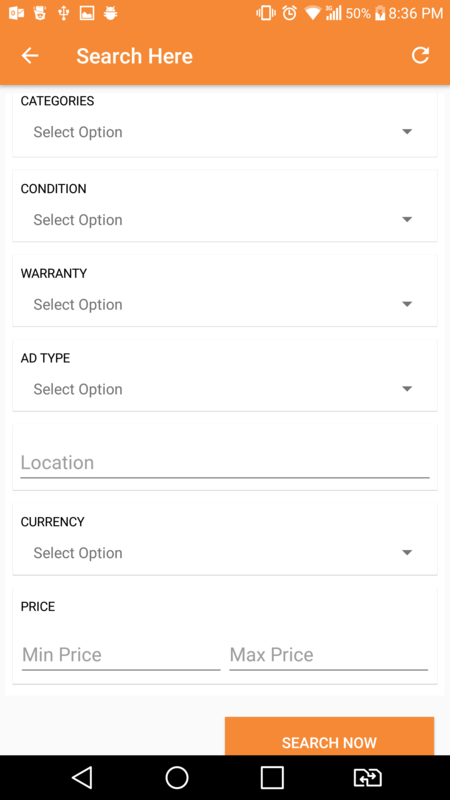 Is apps setup charges are included in purchase? No, you need to setup at your own however we've complete documentation that will let you know how to move forward. If you want us to set up for you then please contact us. Do not miss your customers from android & ios devices to facilitate them with most convenient way to post their ads. Take a step ahead from your competitors. Do you still have any query or have some new features request? Feel free to wite us. We will get in touch with you and send your suggestions to our developers. Are you Interested in new updates? Subscribe here for updates about applications.